Number Built : During 10 years of production 1,181 H-19 Chickasaw helicopters were produced. Powerplant: One Wright R-1300-3 radial air-cooled engine, 800 horsepower. Weight: Empty 5,250 lbs., Loaded 7,900 lbs. Dimensions: Rotor diameter 53′, length 42’3″, height 13’4″. Performance: Maximum speed 112 MPH, Cruising speed 91 MPH, Service ceiling 5,800 feet. The UH/HH-19 Chickasaw is the original Air Force “Whirlybird” helicopter. It was first test flown during November 1942. 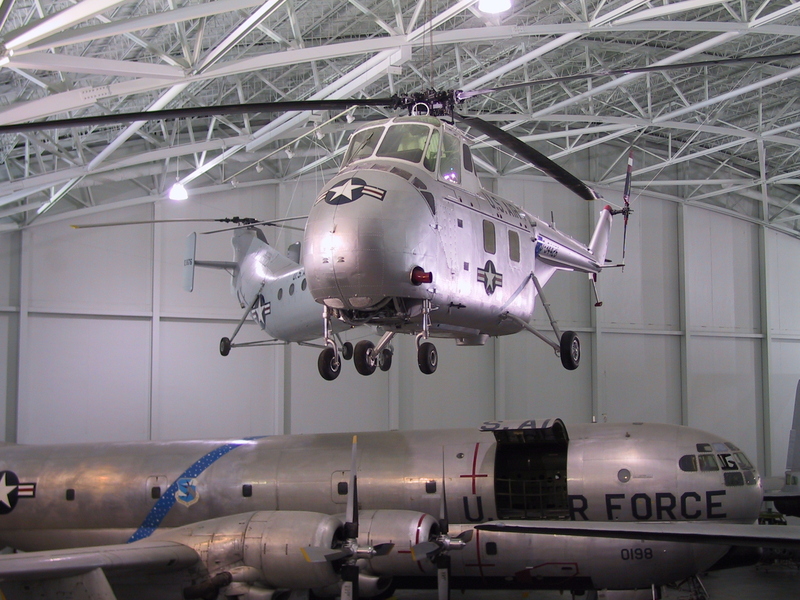 It was developed from the Sikorsky S-55 and was the first transport helicopter to receive Civil Aviation Authority approval for commercial operation. The first Military version was test flown in November 1949, and production continued until March 1961. The Korean War provided a rigorous proving ground for the Chickasaw’s payload carrying capabilities. In July 1952, two Military Air Transport Service H-19s completed the first transatlantic helicopter flight from Westover AFB, Massachusetts to Prestwick, Scotland by way of Labrador and Greenland. This flight was completed in 42 hours and 25 minutes.